Ask anyone what the secret to a company's success is and the best will always respond with "our team". This is the essential focus. What really drives Lincoln Strategic is the excitement of developing a team and finding the perfect professionals who will complement the skills of the others in the group. Unfortunately, this has become a lost art. Our specialty lies in forecasting – knowing where the industry has been and where it's going. 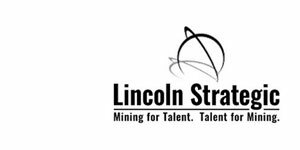 Lincoln Strategic Inc. has been involved in the business of mining recruitment for almost a decade. From this, we’ve gained incredible insight into what will truly make a given venture successful and have put this knowledge to work for our clients at Lincoln Strategic. We can get you from A to Z without the trouble of all the hoops that most people jump through in between. Quality process management and proper business intelligence will considerably affect your bottom line. A dedicated team who will be loyal to your objectives and find you the best solutions. The absolute elite in networking personnel. The right answers to your unique problems. A proven process for maximizing output while amassing the best team possible. HR recruiters know their realm, but rarely can they see the broader picture. At Lincoln Strategic, we offer you not only the right context, but also personnel solutions to the problems you have yet to encounter. A complete walk-through of the process to assure that you are confident with what will make your team successful. Excellence in team building, professional development and performance. Constant vigilance in our follow-ups throughout the year to ensure quality and satisfaction. With Lincoln Strategic, you will not be left wandering in the dark. We're currently seeking anyone who needs business and personnel consulting for the mining industry around the globe.